Director – Tay Garnett, Screenplay – Edmund Beloin, Based on the Novel by Mark Twain, Producer – Robert Fellows, Photography – Ray Rennard, Songs – Johnny Burke & Jimmy Van Heusen, Special Effects – Gordon Jennings, Art Direction – Roland Anderson & Hans Dreier. Production Company – Paramount. After being hit by a lightning bolt, blacksmith Hank Martin wakes up in the year 528 A.D. He is found by the knight Sir Sagramore and taken to the court of King Arthur. There Sagramore elaborates the tale of how he captured Hank and calls him a dragon in human guise, whereupon Merlin sentences Hank to burn at the stake. Hank manages to escape his fate by displaying ‘magic’ with the inventive use of a convex lens and a box of matches. Knighted as Sir Boss, he woos the beautiful Lady Allesande. He must fight a duel for her hand with her intended Sir Lancelot, which Hank wins using a lasso. However, when he and Arthur set out to examine the conditions in the kingdom, the evil Merlin takes the opportunity to imprison Arthur and steal the throne. 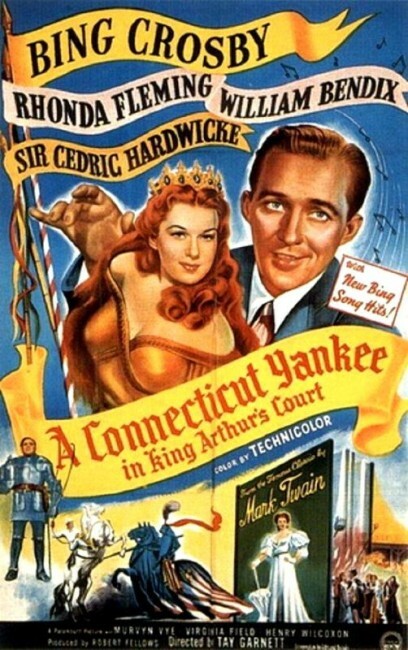 A Connecticut Yankee in King Arthur’s Court (1889) was one of Mark Twain (Samuel Clemens)’s lesser regarded classics, although it did cause considerable upset when it came out, offending the British with Clemens’s vulgar lampooning of they and the monarchist tradition. The book has proven extremely popular on film. This was the third cinematic version. The first film was a silent version A Connecticut Yankee in King Arthur’s Court (1921), followed by a sound adaptation A Connecticut Yankee (1931) starring Will Rogers. There have been numerous others since, almost all made for tv – A Connecticut Yankee in King Arthur’s Court (tv movie, 1978) and A Connecticut Yankee in King Arthur’s Court (tv movie, 1989). Disparate versions include Disney’s Unidentified Flying Oddball/The Spaceman and King Arthur (1979), which diverted from the story somewhat and added a bevy of space shuttles and android duplicates of the hero; A Kid in King Arthur’s Court (1995) and A Young Connecticut Yankee in King Arthur’s Court (tv movie, 1995), which played it out as kid’s movies; the modernised A Knight in Camelot (tv movie, 1998) with Whoopi Goldberg as the time traveller; and Black Knight (2001), which cast Martin Lawrence as a hip Black man thrown back in time; even A Connecticut Rabbit in King Arthur’s Court (1978) with Bugs Bunny. This version is usually the best regarded of all the adaptations but makes for painful watching today. Though the adaptation is generally faithful to the book, in terms of production values it is conducted at the level of a high school pantomime cardboard and tinsel spectacle (although it is at least well photographed in Technicolor). Where Mark Twain engaged in an amusingly vulgar satire of the English, the film reduces the Arthurian cycle to the punching bag of idiot buffoonery – King Arthur is portrayed as a doddery old man, Merlin as a scheming conman, while the Knights of the Round Table are there only for the brunt of Bing Crosby’s idiocy. Case in point – the supposed outrage at the feudal exploitation of the peasantry, a wrong that is never remonstrated about any further than the requirements of a plot point. The worst thing about the film is Bing Crosby who walks through proceedings with a bland non-expression that suggests a lost puppy dog, challenging everyone he meets with the honorific ‘Buster’ or ‘Bub’. 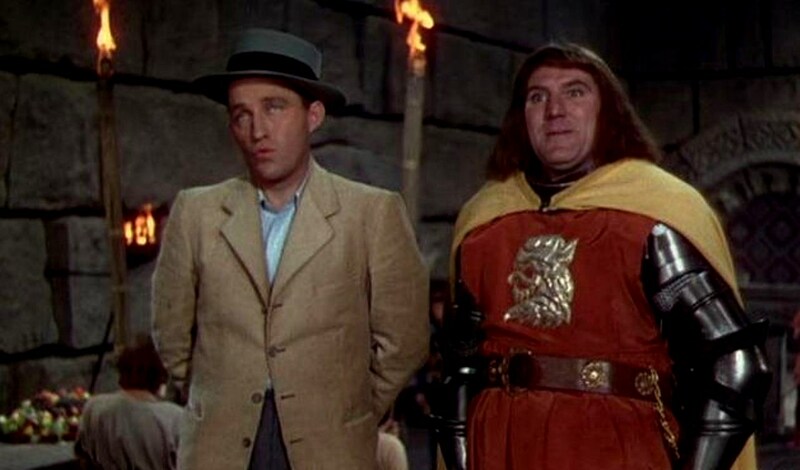 In one scene, following a lengthy villainous tirade from Merlin, Crosby’s only reply is to nod and a comment “Nice guy” to nobody in particular. It is this kind of watery idiocy that states a good case for retroactive abortion.